For the region, see Andalusia (region). Andalusia is a formable country that can be formed by Granada and all Muslim countries with Andalusian/Maghrebi as primary culture. Golden Century Andalusia has an unique set of missions. To form Andalusia, all provinces in orange must be owned and cored, as well as either the two green or the two red provinces. All shaded provinces are permanently claimed after formation. Once all of Iberia was ruled by the glorious Muslim rulers of Andalusia. Let us undo the shameful Christian Reconquista and retake the lands of our ancestors. is not Spain, Andalusia, the Papal State, the Holy Roman Empire or the Roman Empire. 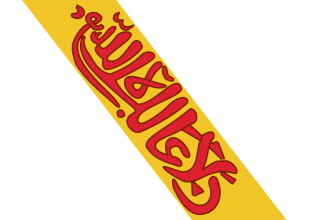 is in the Maghrebi culture group or has Andalusian as primary culture. is in the Muslim religion group. it can not be a former colonial nation. it must have at least 6 cities and must own at least 1 province in Upper or Lower Andalucia. has not a tribal government. 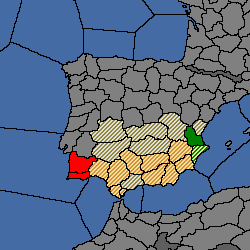 owns its core provinces: Murcia (221), Granada (223), Sevilla (224), Córdoba (225), Gibraltar (226), Jaén (1748), Cadiz (1749), Almería (222), Albacete (4547) and Huelva (4548). owns either its core provinces Algarve (230) and Beja (229) or Alicante (1750) and Xàtiva (4549). Córdoba (225) becomes the capital. then Andalusian becomes primary culture. every not-owned province in Toledo, Upper and Lower Andalucia areas. Complete mission "Rout the Pretenders!" event ‘New Traditions & Ambitions’.